Gallia Sheriff Matt Champlin discusses with area behavioral health service providers about a developing rapid response team to address substance abuse. 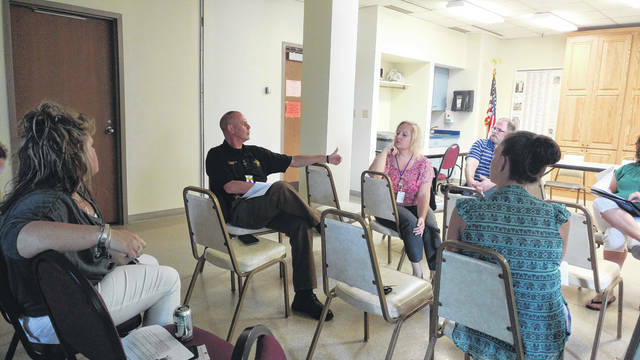 GALLIPOLIS — Area behavioral health service providers and concerned residents gathered with Gallia Sheriff Matt Champlin Wednesday afternoon in the Gallia Courthouse to discuss the creation of a rapid response team meant to quickly offer guidance to individuals who recently overdosed in hopes of getting them onto the path of recovery. Gallia Citizens for Prevention and Recovery was among those present. Champlin said the effort was meant to educate individuals and addicts struggling with substance abuse to find another option. “A lot of times what we see from the law enforcement side is it’s a person who has obviously not surrounded themselves with good people and don’t have any good resources and support available to them,” said Champlin. The sheriff said he felt his office would serve as a primary organizer as it often had access to information about individuals who had recently overdosed. Champlin said the rapid response team in Gallia may take some tips and training advice from law enforcement in Lucas County as he was in talks with officials there. Ideally, he said he would like to see a small training held in Gallia for the response team. Gallia CPR Chairperson Thom Mollohan expressed that it was challenging at times to find residential beds for individuals looking for treatment in the immediate area, among other concerns discussed with the group. The idea of recovering addicts visiting with those who had overdosed was also posed by a member of the meeting. Champlin said at the moment he wondered if law enforcement and health professionals visiting would be the best route until liability concerns could be explored with other visitors. According to Champlin and current Gallia Sheriff’s Office policy, when interacting with an individual who has overdosed, the sheriff’s office gives the individual the option, after having administered Narcan, to go into medical care. If the individual refuses, the individual could potentially be charged with disorderly conduct violations. Group members traded contact information in order to develop further communication.